Central’s Sia Patel moves the ball down the line past Turner Ashby’s Emily Rees during soccer action Wednesday night in Woodstock. Central’s Hannah Dellinger and Turner Ashby’s Reese Pangle eye the ball. Central’s Sia Patel puts pressure on Turner Ashby’s Kara Longenecker near the goal. Above, Turner Ashby’s Grace Mowery and Central’s Gracie Foltz chase down the ball. Below, Central’s Hannah Dellinger splits Turner Ashby defenders Kara Longenecker, left, and Reese Pangle, right. Turner Ashby’s Taylor Andrews and Central’s Kelly Reynoso collide while chasing a loose ball. Central’s Juliana Baker moves the ball down the sideline while Turner Ashby’s Jenny Bejarano-Lopez defends. Central’s Hannah Dellinger splits Turner Ashby defenders Kara Longenecker, left, and Reese Pangle, right. 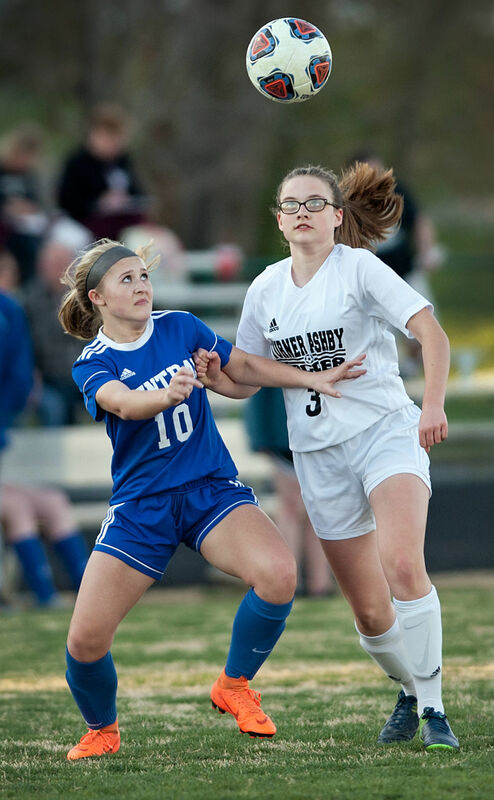 The Falcons and Turner Ashby ended in a 0-0 tie for the second time this season. The two teams played to a 0-0 tie on March 12. The Falcons outshot Turner Ashby, 15-11, in the contest. Central had a couple of good scoring opportunities but wasn’t able to get the ball in the back of the net. Central junior forward Hannah Dellinger had the majority of the team’s shots but couldn’t quite finish at the net. Hannah Dellinger is the team’s top returning scorer from last year. She’s still looking for her first goal this season but said she feels confident the goals will come. One constant this season has been the play of the defense. The Falcons have allowed just 16 goals in seven games, seven of which came to Handley in a game early in the season. Central senior goalkeeper Kendall Herbaugh said she’s been very pleased with the play of the defense, which includes some younger players. Probably the best scoring chance for either team came in the overtime period. Herbaugh came out of the net to play a ball but it got past her. Matthews was able to beat several Turner Ashby players to the ball and kick the ball out of bounds. Herbaugh, who had six saves in goal, was replaced in goal by Laura Spackman for the last three minutes of overtime. Herbaugh then moved to forward to try to ignite the Falcons’ offense. Earlier this season, Herbaugh scored two goals in the final 10 minutes to lift the Falcons past Fort Defiance. Herbaugh has Central’s only goals this season. The Falcons have shown steady improvement throughout the year. The Falcons gave up only four goals to Handley the second time they played them, after giving up seven the first time. They also hung with Class 2 powerhouse George Mason, losing 3-0, last week. That is the only Bull Run District game they have played. Kim Dellinger said that he expects his young squad, which has just two seniors to go with a combined seven freshman and sophomores, to keep making steady improvements as they play the rest of their district season.